When Tech North kicked off its government-backed quest to make the North of England a better-known and more appealing place for technology startups (read our earlier in-depth report for more on that), it wanted to find a small group of companies to act as ‘leading lights’ that it could show off to the rest of the world as highlighting the talent and potential in the region. What followed was a two-month ‘Northern Stars’ pitching competition, with heats in cities across the North (disclosure: I was a judge at one heat), and yesterday a final took place in Manchester to decide the winners. These are the ten that were chosen by a panel of judges including representatives from Seedcamp and Startup Bootcamp. Below the list, I’ve offered some analysis of how these ten teams fit into the broader perspective of Northern tech. Based in Sheffield, Airstoc is a marketplace for commissioned and stock drone video footage is the first of its kind. As seen on TNW. ‘Staff optimization software for call centers’ may sound like the gateway to bleak, workhouse-like conditions, but Teesside startup EvaluAgent‘s set of cloud-based modules focuses on making staff happier through gamification. This ‘Google Analytics for Web forms and checkouts’ product is designed to help retailers and other businesses work out why people abandon transactions. Based in Manchester, Formisimo is another one on the list that we’ve previously featured on TNW. Geek Talent, based in Sunderland, offers a tech recruitment platform and a product that helps students make better-informed decisions about their education and careers. Both are rooted in deep-data analysis and the company is next moving into the realm of personal data management. Manchester-based Gnatta allows businesses to manage communication with customers across multiple channels (phone, email, etc) from one interface. In-Part helps universities and businesses collaborate via an online platform. After starting off in the UK from its base in Sheffield, the company has now signed up its first US universities, including CUNY, the University of Pennsylvania and Princeton. Leaf.fm combines music discovery with a direct-to-fan marketplace. Based in Newcastle, it’s built on top of YouTube and includes playlists curated by experts. After making its name with ‘Tinder for beards’ app Bristlr (as seen on TNW), Manchester-based M14 Industries is working on a fully-fledged dating app platform. Manchester-based analytics firm Peak lets companies outsource their business intelligence tasks to its data-as-a-service platform. Based in Sheffield, Receptive allows SaaS companies to to collate product ideas and feature requests from users in a way that is easy to work with. 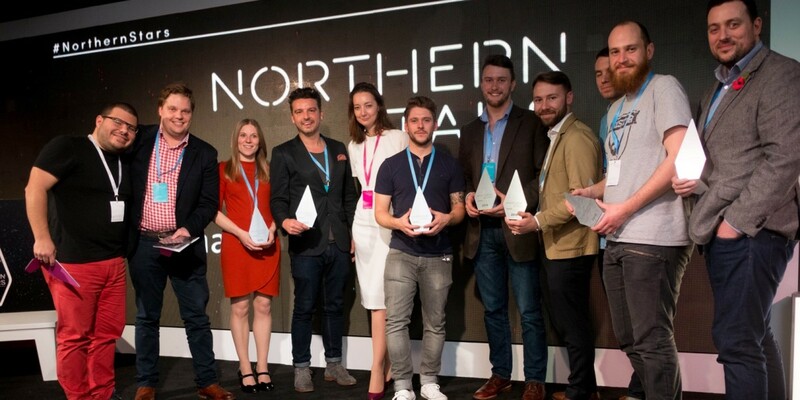 While there are many other Northern companies I’d have considered for my own top ten (not necessarily ones that entered this competition), the final selections here represent a good spread of the kinds of young companies on offer in the North. B2B and data-focused firms are strong in the region, and while consumer firms are generally less well represented in these parts, there are some gems if you know where to look. Of the startups selected, I have concerns about Leaf.fm’s longterm prospects, given how notoriously strict YouTube can be with developers of music apps that use its content, and especially now that it offers its own music service. On the whole though, it’s a selection that acts as a good taster for the broader offering in the region (see my previous report for more on that). One area of startup activity missing from the winning ten, but represented among the finalists, was those with a social enterprise approach. Foodbank App pitched at yesterday’s event with an app designed, unsurprisingly, to help foodbanks with their work. Of all my tweets from yesterday’s event ( I tweeted about each startup), the one about Foodbank App got the most engagement. Dotforge has run two ‘Social Impact’ accelerators in the North over the past year, and while the startups involved might not all be the kinds of companies that will see a mega exit, they’ve doing good, innovative work. I can see why Foodbank App didn’t make a final 10 partly aimed at attracting investor attention from outside the North, but it’s worth noting that there’s a lot of interesting tech/social enterprise work happening in the region. The Northern Stars winners will go on to appear at a number of tech events, including SXSW. Meanwhile, all participants in the competition will join a forthcoming Founders Network that Tech North is launching to improve dialog between startups and offer support to aid their growth.